I'm back from my adventures in France and England, still catching up on posting here, there's a lot more to come, so stay tuned. I was away doing a one month painting class in France at Studio Escalier with guest teacher, Rita Natarova, (more on that in a future post). 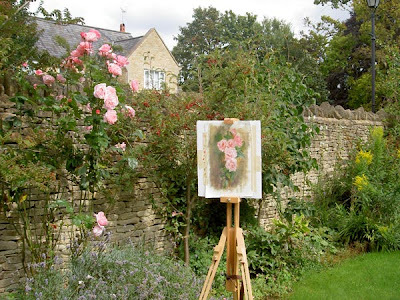 Afterwards I passed thru England on my way home, and spent a week in the beautiful scenic Box area, where I went for long walks in the countryside, did a bit of painting, hung out with some friends and sorted out some music publishing at Realworld Publishing. Singer/songwriter Carole Rowley, who I'd only met once years ago, happened to be in town and generously invited me to stay a few nights with her in nearby Corsham. 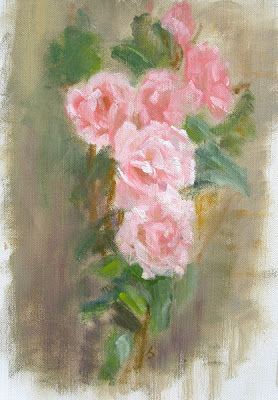 The roses were in the back garden, begging to be painted. 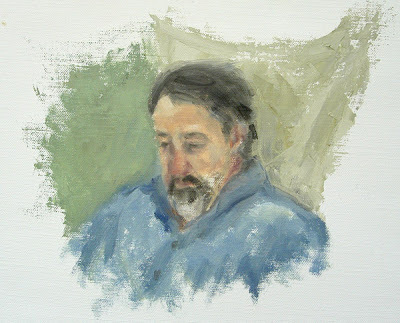 While in Box I also decided to test out my new portrait-painting skills and did a quick oil sketch of Realworld publisher and friend, Rob Bozas as he relaxed reading on his verandah one lazy Sunday afternoon. Although not quite as bold as I had originally envisaged, we were both quite pleased with the likeness and I actually don't mind the quiet vibe. I'll be uploading more paintings in the next few days so watch this space!